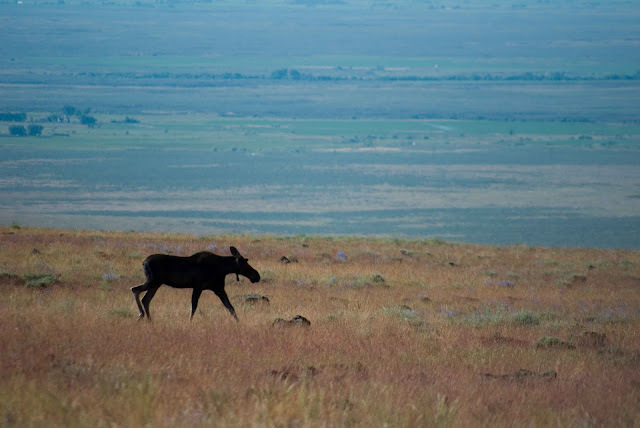 Heidi and I were pleasantly surprised to find a young bull moose in the most unlikely of places. Wandering across the dry grass and sagebrush country of the Bennett Hills, the little dude was very far from any good moose habitat. Most of the creeks in the canyons have dried up, and it is a long walk in any direction to any good eatins. As weird as the sighting was, it exemplifies the importance of the conservation of corridors for wildlife. As is, the Bennett Hills provide wonderful habitat for a great variety of desert (sage grouse, burrowing owls, pronghorn antelope, raptors, etc, etc) and non-desert species (as represented by the black bears and the Pacific tree frog mentioned and photographed in previous posts). But the Bennett Hills are also a travel corridor, a passageway for dispersing individuals to get from one population to another. The ability of wildlife populations to do so is critical in maintaining genetic diversity as well as reducing the effects of inbreeding in populations. It also helps to establish or maintain populations that have been eliminated or reduced. Humans are really good at destroying and fragmenting habitat. This is why I love Idaho. Even though there is aplenty of habitat degradation and elimination here in Idaho, there is also a gihugic (gigantic+huge) amount of habitat that is left relatively untainted, and will probably remain so for a long time. Why? Because Idaho has an amazing amount of country that is too difficult to access, explore, and exploit. The mountains are too steep. The deserts are too dry. The roads are too rough and too far to travel. "I can't grow my potatoes here with all this derned lava rock everywhere!" And the government owns most of it. Destruction is much, much easier than creation. I admire all who take on the challenge of creating habitat instead of destroying it. And conserving habitat these days is the same as creating it. I am glad the Bennett Hills belong in the hands of the BLM. I am glad there are still wanderers pilgrimaging across the desert. Marvelous photo and what a great post too, one that goes beyond "this is what we saw" to "this is what it's all about" and raising thoughtful and important points to ponder. Wonder if this pilgrim will find one of those guzzlers to help him along his way.